What to Know Before Buying a Portable Dust Collector | Atlantic Design, Inc.
Handrails are an easy option to increase safety on a mobile dust collector. ALL PHOTOS: © ATLANTIC DESIGN, INC.
Buying a portable dust collector unit is a big endeavor, but familiarizing yourself with the design pros and cons of the main components can make the process easier. There are many aspects to consider when designing a collector, including air-to-cloth ratio, can velocity, filter interstitial air velocity and fan static pressure. While we will not get into all the engineering details of these features here; we will cover the types of questions you need to ask to make educated decisions, ensuring a successful and profitable job. 1. WHICH SIZE DUST COLLECTOR DO I NEED? The short answer is, “Bigger is better.” A larger dust collector can always be used for a smaller project; whereas a dust collector that is too small for the job will never be able to deliver acceptable results. Which size collector has worked best on previous projects? If you are bidding similar projects now, then what worked before is a good place to start. Could any past projects have been completed faster or more efficiently if a larger size collector had been used? What equipment will be available to move the collector? In general, you want the largest collector you can maneuver and use, as the more powerful collectors are larger in size. Larger collectors require a larger towing vehicle. Conversely, some jobs might allow for two smaller collectors, which can be more easily towed and placed on the job site. Running a larger collector at lower capacity will not hurt the collector or filters. 2. DO I WANT A TRAILER- OR SKID-MOUNTED COLLECTOR? Choosing between trailer or skid is directly related to the type of projects the collector will be used on. Trailer-mounted units are best for projects that primarily have road access. For job sites where crane lifting is required to move the equipment, skid-mounted is what you’ll want. Some trailer units have available options with crane-lifting features built in. While cumbersome, they allow the entire unit with trailer to be moved with a crane when there is no road access. 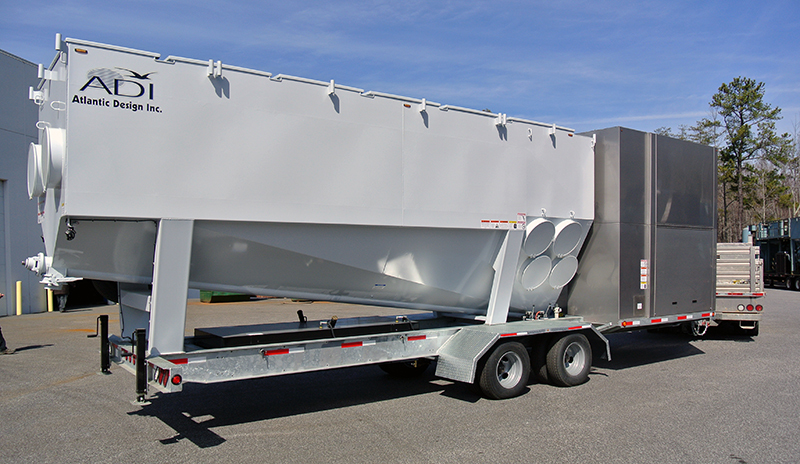 An ideal solution for maximum transportation flexibility is a special skid-mounted collector designed with the option to be affixed temporarily to a trailer. This offers the best of both types in a single unit. 3. WHICH TYPE OF FILTER MEDIA IS BEST FOR MY PROJECT? There are several types of media used in portable dust collectors, and picking the correct one for your needs might be the most important factor in the success of your job. Since almost all mobile collectors use pleated cartridges with pulse-jet filter cleaning, we will focus on media used in these types of collectors. First you will need to know if there are any specific filter efficiency requirements for your project. These are usually listed as HEPA or MERV ratings. Pulse-jet cleaning uses a burst of compressed air directed down the interior of the filter to temporarily reverse the air flow and flex the filter media outward to release the dust. Pulse length varies with cartridge design, type of media and size of the cartridge but will always be a short burst. Any extended pulse longer than required to flex the media is wasted energy, so you will want to know which pulse length is best for the media you choose. Pleated cartridge filter media is typically separated into two types: 100-percent polyester and a cellulose blend. Polyester filters provide the most air flow per square foot of filter media with the least amount of flow resistance (differential pressure) and can easily be used for years, when cared for properly. The predominant polyester filter material on the market today is the spun bond type, which was developed specifically for use in pulse-jet dust collectors. Most other filters fall into the cellulose or the cellulose-blend category. These media types use paper as the primary material with other materials, such as polyester or fiberglass, blended in to aid in dust release. Paper cellulose media are rated to filter smaller particles with increased pressure loss through the filters and have a much shorter life, requiring more frequent filter changes. Originally used as intake filters for engines and compressors, these materials have improved in recent years to offer better dust release and cleaning for use in pulse-jet dust collectors. For most blasting applications, polyester filters will be the more efficient and economical choice, but for applications where filtration specifications cannot be met with polyester, the cellulose-blend filters are a viable alternative. Skid-mounted units are ideal when there is no road access at a job site. 4. WHAT STYLE FILTER ARRANGEMENT IS BEST — VERTICAL OR HORIZONTAL? The two types of filter arrangements for cartridge filters in portable collectors are vertical and horizontal. Horizontal filter arrangement was originally designed for light dust loading with small dust particles, usually in a down-flow dust collector design. By their very nature, horizontal filters cannot utilize all the filter area, as the top of the filter becomes buried in dust and the downward air flow is limited to the space between the rows of filters. Vertical arrangement is used for heavier dust loading with relatively large dust particles, typically encountered on an abrasive blasting project. The vertical arrangement allows for the natural release of dust from the filters and removal from the dust collector. For the abrasive blasting industry, the vertical filter arrangement is preferred. 5. HOW MUCH FAN STATIC PRESSURE IS NEEDED? Portable dust collector pressures are normally measured in inches of water gage, which is the number of inches of water the fan will lift in a manometer. Essentially, the higher the number of inches, the greater the pressure and more powerful the fan. More pressure allows the dust collector to be located farther away from the containment area while still maintaining full air flow. Another advantage of more fan negative pressure is that more pressure is available to move air through the filters. This is especially important for the cellulose filters, which require more pressure to operate. Always look for the unit with the most static pressure. There is no efficiency lost running a more powerful fan at a lower capacity. Sound enclosure upgrades are available to reduce noise. 6. DO I WANT A DIESEL ENGINE OR AN ELECTRIC MOTOR DRIVEN FAN? This is another component that really depends on the parameters of your job site. If electricity is readily available at most of the sites where you will be using your dust collector, then the electric motor is preferable, as it eliminates the need for diesel engine fuel, maintenance and operating costs. Even if some of your job sites will not have easy access to electricity, using an electric motor powered by a portable generator may make the most sense economically. If the majority of your projects do not have electricity readily available, then a diesel engine drive will be your best option. Note that some units can be quickly changed from diesel to electric and back, and some units even have both the electric motor and diesel engine mounted. The best solution is to pick the unit that can work with either diesel or electric. You can quickly change to the other drive if the need arises later. 7. WHICH FAN STYLE IS BEST FOR BLASTING? Choosing the right fan design is as important as selecting the appropriate type of filter. Using the incorrect fan design can cause reduced air flow and, subsequently, more fuel consumption. You will want to choose a fan designed for use on a dust collector. Otherwise, the shape of the blades can cause dust buildup, putting the fan wheel out of balance and causing catastrophic damage. A typical design for the fan for larger collectors would be a steel wheel featuring a backward-inclined blade arrangement with the shaft bearings out of the air flow. These are non-overloading, which means they will not overpower the engine or motor drive and can work effectively at different air flows. Keeping the bearings out of the air flow helps prevent overheating and premature bearing failure. For good performance and long life, look for fans with a backwardly inclined fan wheel made of steel, with bearings external to the air flow. For backwardly inclined, non-overloading fans, once the fan makes full vacuum pressure, the amount of horsepower drops as the air flow drops and will not overload the motor. These fans can be run at less than full air flow as needed for smaller jobs. 8. HOW SHOULD THE DUST BE DISCHARGED FROM THE COLLECTOR? 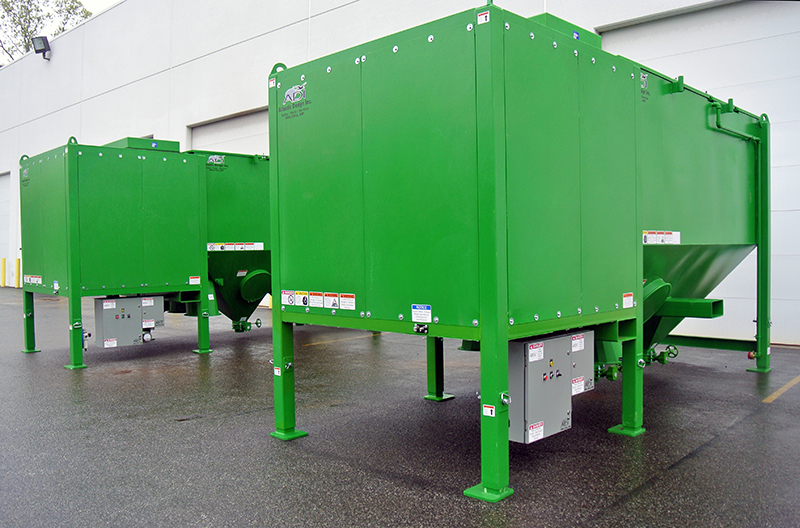 Most trailer units will use one to four augers to move the dust out of the collector. Augers are usually the most troublesome component on the collector, so the fewer used the better. You will want to make sure the dust discharge location is high enough to discharge the dust into full-size containers — usually 55-gallon drums. If the discharge location is too low, then the dust will usually need to be discharged into multiple containers, causing extra handling and dust exposure for operators. Always look for a collector using a single auger with a high dust discharge. Dust collectors are not designed to store dust. Leaving dust in the hopper will cause dust to churn and stay suspended in the air stream overloading the filters, reducing air flow and possibly causing filter damage. If you’ve done your homework and know the answers to these eight questions, you can be confident that you’ve made the most informed decisions concerning your purchase. Getting the properly sized and functioning dust collection equipment will lead to less down time, greater production, improved safety and consequently, a better bottom line.